Tax day has come and gone. The streets are filled with zombified CPAs, lurching from citizen to citizen, desperately trying to find something to total or deduct. Pray for a sunny day. As soon as the light burns through their green eye-shades they'll collapse and sleep the sleep of the un-audited for yet another year. It was a little tougher to go through the process this year. The world economy is in shambles, real estate values have cratered, retirement accounts have disappeared and we're all being asked to send money to the Masters of Business, (MOB). Yesterday was a tough day. First I tried to give my tax check to a Banker, but he was off on a private pheasant hunt. Then I found out there was no truth to the rumor that we were allowed to drop off our payment checks at the local Chevy dealer. So I settled for "old school" and just went to the post office. April 16th, bled white and feeling a little green. Put the shallots, garlic, ginger, lemongrass, chilies and cilantro in a food processor. Pulse to form a paste, (you may need to add a little bit of water to get to the right consistency). Stir in the ground coriander. In a saute pan large enough to hold the fish in a single layer, heat the tablespoon of cooking oil over medium high heat. Saute the paste for 2 minutes. Add the coconut milk and bring to a gentle simmer. Add the fish, cover and simmer for 5 - 7 minutes, (assuming a 1 inch thickness of fish). 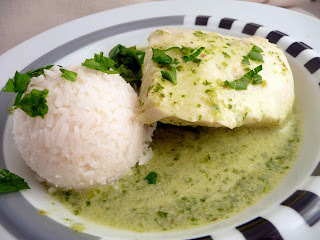 Note: If the fish is not fully submerged, gently turn the fish halfway through the cooking time. While the fish is simmering, wilt a bag of fresh spinach in a small amount of boiling water. Or rinse the spinach and do not shake dry. Saute briefly in a covered saute pan. 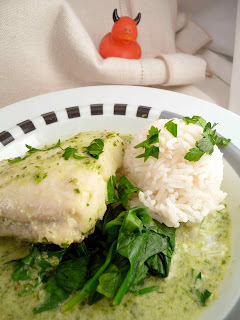 Place some spinach in the bottom of a serving bowl, top with fish, sauce and a sprinkle of fresh cilantro leaves. Serve with a scooper of rice. OK, another simple recipe that takes 30 minutes - tops - to prepare. Well, back to the salt mines for me. Until next time, remember crablings, you can do it, you can cook. I trust your banner will return to the usual calm picture??!! I recently heard a radio interview explaining the complexity of a U.S. tax return - I had no idea...my French return takes about 30 minutes - it is quite straight forward. Poor you...relax with a large glass of red! We have reached the fork in the road with this dish. Some people like a neutral dry white wine with this dish due to the complexity of flavors. If you are in this school, try a Pinot Gris from the Alsace region of France. Trimbach is widely available and about $20 a bottle. Some people like to throw contrasting spicy flavors in the wine to enhance the dish. This school leans to Gewurztraminer from Alsace, France. Trimbach is widely available and about $20 a bottle. If you like this dish with more heat, then you want more sweet in the wine. Look for a Kabinett level Riesling from the Rheinpfalz region of Germany and expect to spend $20 a bottle for a good one.